Wendy Wees is one of 41 talented artists exhibiting work in SAM’s kick-rear-end staff art show, on view through October 2 in the first floor Community Gallery off South Hall at Seattle Art Museum. Wees won recognition from her peers at the show’s opening on September 7, when her piece was selected by viewers as the favorite from this group of thoughtful, diverse artworks. One intriguing quality of Wees’s painting relates not to what it reveals, but to what it denies the viewer. Her award-winning painting, titled Verticalverses017.ptg, is part of a new, exploratory series for the artist that she calls Vertical Verses. 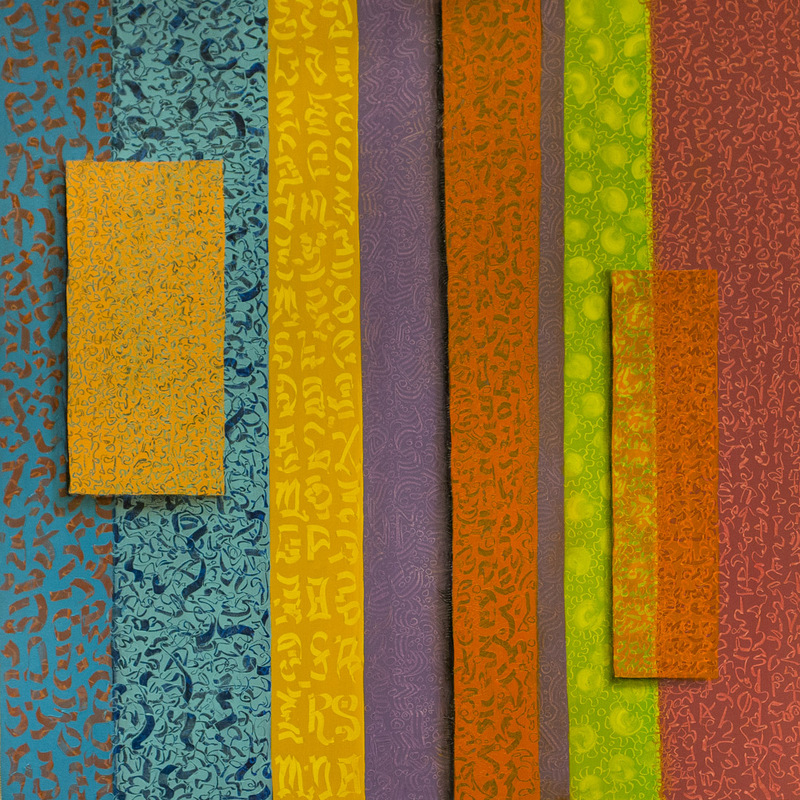 These colorful works, appropriately arranged in vertical bands, play with script in a way that recalls, and references, Mark Tobey’s “white writing.” In her process, Wees paints on the vertical bands in layers, in some passages allowing the color blocks to visibly overlap and bleed into one another. Then, using a range of tools, she carves beautifully calligraphic characters into the color blocks, scraping at the paint and revealing the layer beneath. These characters lead the eye fluidly down and back up the canvas. Within each band, Wees works in the same script style, filling the color block to create an all-over design pattern, and showing impressive control in doing so. From one color block to the next, the characters and their stylistic influences change: Wees varies the shape, curvature, and width of the marks, as well as their impression of energy. The final result is a lively piece that features a range of scripts resembling, in different passages, Latin and Islamic manuscripts, Chinese and Japanese calligraphy, and fanciful doodles. The characters in Wees’s Vertical Verses draw us in, and then stunt our understanding. They are unintelligible, part of a category called “asemic” writing—a term that describes lettering with no semantic content. Literally speaking, the groupings of characters don’t mean anything. But the forms, as visual art, prove absorbing and more than capable of communicating. For Wees, as for other artists who have employed asemic marks, such as Tobey, the choice to imagine and invent characters rather than working with a known and recognized alphabet, is liberating. First, denying viewers the access to one straightforward message opens up myriad possibilities of individual readings. The work prods a lazy viewer into activity, as the viewer’s role in creating meaning, always present, comes to the fore. In this way the artwork’s ability to communicate becomes dramatically enhanced. Wees wants viewers to actively engage with her work, and her unintelligible script prompts this kind of interaction. “I find that people are drawn into the paintings because there are layers of ‘visual stories,’” she explains. “Viewers are searching for the meaning. I have seen them inspecting the work close up and then standing way back, and then being drawn in again.” Finally, the part of her work that is youthful and whimsical, maybe a reflection of her background as an illustrator, finds its best expression in an art that moves her viewers into an imaginative mode of thinking with bilateral idea-sharing. At the heart of Wees’s creativity is her belief in art’s transformative power. “Art is a powerful mode of communication which transports viewers to other worlds, other feelings and different thoughts and ideas,” says Wees. “It does not have to be a complex response,” she adds, pointing to the way her paintings communicate on a visceral level without stating anything explicitly. Wees has worked for SAM for almost ten years and has devoted much of that time to the SAM Shop. In her current role as Retail Sales Associate, one of her responsibilities is to assist with crafting new shop displays, for which her team draws inspiration from SAM’s rotating special exhibitions. It’s a role that encourages and sparks Wendy’s creativity. As an artist, Wees also counts access to SAM’s permanent collection as an invaluable encouragement to her own work. Her persistent efforts as a practicing artist have earned Wees representation at Gunnar Nordstrom Gallery in Bellevue, situated adjacent to Bellevue Square, where she received an exhibition in 2014. In addition to showing at Gunnar Nordstrom Gallery, Wees has exhibited at Soulard Art Gallery in St. Louis (2013); Rob Schouten Gallery on Whidbey Island (2012, 2010); Krab Jab Studio in Georgetown (2011); Columbia Art Gallery in Hood River, Oregon (2010); and the Frye Art Museum (2001). Congratulations and thanks to Wendy for her thoughtful painting and her important work in the SAM Shop! You can see more of Wendy’s work at Gunnar Nordstrom Gallery’s website. Images: Courtesy of Wendy Wees, from the series Vertical Verses.